Once you are Logged in, go to the page you want to edit. 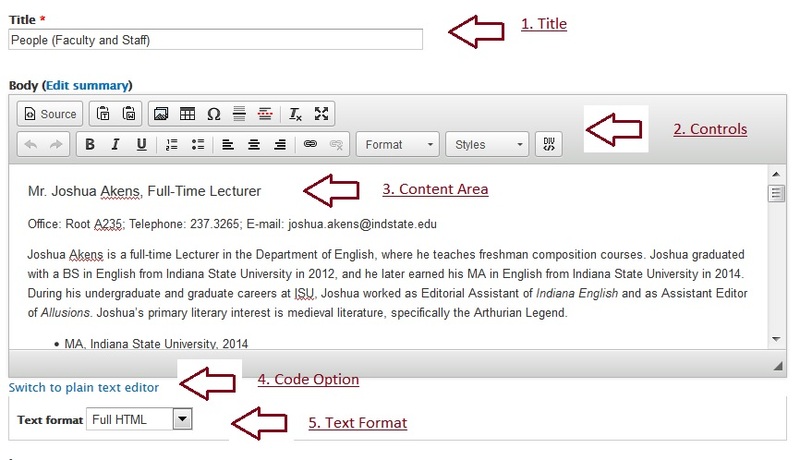 Then click "Edit Draft/New Draft" and Proceed with Editing the page. If you dont see the option "New Draft" or "Edit Draft" that means you dont have permisions to Edit this page. Please contact the Admin for more Information. 1. Title: This is the title of your page as well as the default name for the link to your page. 2. Controls: A lot of these controls provide work a lot like Microsoft Word. 3. Content Area: This is where your web content is located. You can edit, change, and remove content in this area. 4. Code Option: If you desire to view and use HTML code instead of the standard view, click on "Switch to plain text editor." Once you do, you will see the content as html. One word of caution. Not all html works in Drupal. A lot of the code is removed by the system. If you are in the html view and want to switch back, click on the same link. It will now be called Switch to rich text editor." 5. Text Format: Clicking here provides options. Those options fully depend upon your access level. Most people will see three choices. Full HTML, Filtered HTML, Plain Text. If you are not able to see all of the controls you need, use the Full HTML option. 5. Text Format: Clicking here provides options. Those options fully depend upon your access level. Most people will see three choices. Full HTML, Filtered HTML, Plain Text. If you are not able to see all of the controls you need, use the Full HTML option.